Mike Cavanaugh was a firefighter; it was his job to rescue people. Though inviting them home wasn’t usually part of the job description. But when he pulled Christine Palmer out of her burning house, something about the gutsy single mom made him want to protect her, to make her life a little better. Only somehow, Chris and her family ended up giving Mike’s life new meaning, and he was happier than he’d been in years. 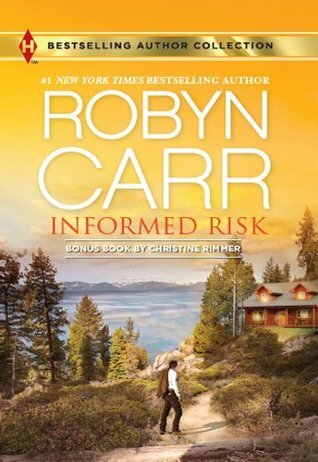 Informed Risk by Robyn Carr is one of her much earlier books. Her writing has developed a lot more over the years, yet I enjoyed this romance between Chris and Mike - or Little Mike as he is known in his family, his Dad is Big Mike! Chris is a young gutsy mother raising two children on her own, one five and the other three. She wants to be a writer and lives in a hovel and works at a grocery store until a fire burns her rented house down. When she is invited back to Mike's place they soon strike up a warm relationship that looks to be going some place good. However Chris is not quite who she appears at first sight, and when her life catches up with her, then Mike struggles to accept all that she brings. Mike is a bit strong fireman, he lost his wife and child in an accident ten years ago, and with his big heart he has a need for it to be shared. He is delighted with his decision to bring into his home two darling children and a dog that insists on eating numerous pairs of his socks. He belongs to a large Catholic family, and his family love each other and look out for each other. When a relation of Chris's arrives on the scene it throws them all for a spin. Mike goes into competition with the aunt, he wants to be the one to provide and be needed. Chris is annoyed by them both, all she wants is the chance to stand on her own two feet and make her own decisions in life. Will they stand back and allow her to do so? This was a warm, pleasant, gentle romance story. In spite of its age, it has stood the test of time well. I enjoyed your review. I haven't read any books by Robin Carr, but reviews are always are positive.